Sam and Frances Giuliani started Antonio’s Pizzeria in 1977 in Uptown Westerville. Frances’ passion for serving her guests her authentic homemade recipes as well as her selfless love for everyone she meets made Antonio's a huge success. 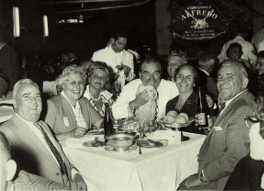 Antonio's was purchased by a large pizza chain and Frances took a break from the restaurant world; but the fire continued to burn inside her and she found herself opening a restaurant once again, this time teaming with her niece Rita and son Robert. We are still using the same wonderful award-winning recipes to provide your family with the highest quality of ingredients, value and service. So if you are one of our many customers from the original Antonio’s, or this is your first time visiting us, welcome to our Family! Take our Survey and Receive a Gift! ©2006-2013 Antonio's Pizzeria | Web Design by Bald Head Design, LLC.